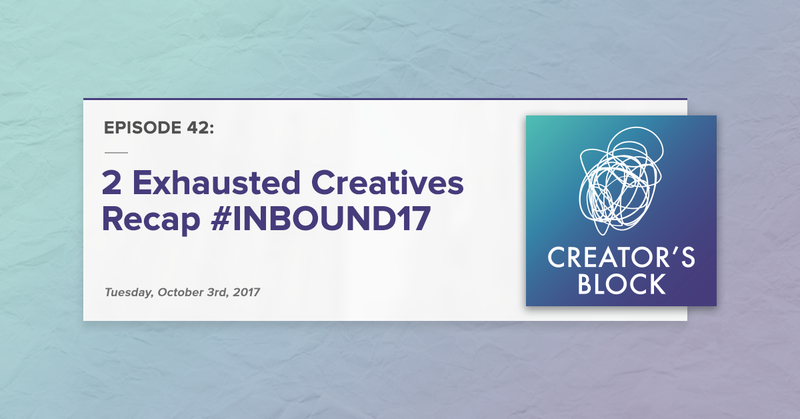 Jessie-Lee and I are back this week, fresh off HubSpot's #INBOUND17 conference in Boston. We spent three full days with 21,400+ of our closest friends in the INBOUND community, learning and getting inspired -- so needless to say, we're a little tuckered. But we're not too tired to talk about our biggest takeaways. Prior to this year, Jessie-Lee and I had both been to INBOUND more than a handful of times as part of the Quintain team -- this year, however, was distinctly different. Learn what the HubSpot COS is really capable of and how it can influence conversion rates. For 2017, we didn't go the ho-hum route, passively attending sessions to get a few tactical takeaways to start using back at home. Instead, we worked. We did live website throwdowns. We were moved by incredible speakers. We crushed some of our personal, big, audacious goals -- and now realize we need new ones. We gained perspective. Most of all, we learned we don't just want to grow for the sake of it -- we want to grow to be better. Big themes of diversity, inclusion, and positivity. Jessie-Lee went to INBOUND to learn... and came home with a mattress. Moving beyond the marketing trope of "authenticity" to a new level of self-awareness. The importance of growing better, not just bigger. How, if you want to stand out, you have to be okay with not fitting in. My INBOUND session wasn't a complete bomb. That one time I embarassed myself in front of Dharmesh at INBOUND Rocks. A tiny rant about buyer personas. What we loved the most about INBOUND this year. "Lady Gaga and Elton John's Amazon Echo"